As a designer of high concept themes, it has been fascinating to have focused our creative energies on something as simple as the element of water over the last six months, but this has provided a rich vein of inspiration which prompted both the design for a C level dinner at One Mayfair and secured Private Drama a multi-national building company’s 25th anniversary celebration event next year. While visiting rehearsals for the Royal Opera House’s Deloitte Ignite Festival earlier this year, we were fascinated by the themes being curated by the Royal Ballet and Dr. Minna Moore Ede, from the National Gallery, which focused on ‘Leda and the Swan’ – the mysterious conjunction of a mortal woman and the god Zeus, who is disguised as a swan. A watery designed world was the obvious environment in which to place a performance of this work and knowing that we would be relocating a series of the dance sequences to One Mayfair for a gala dinner, our design team began thinking how to fashion the space to suggest a watery landscape. Championing the art of performance has always been at the heart of everything we do and, to ensure the guests’ maximum enjoyment, we wanted to place the audience right at the very heart of this world. 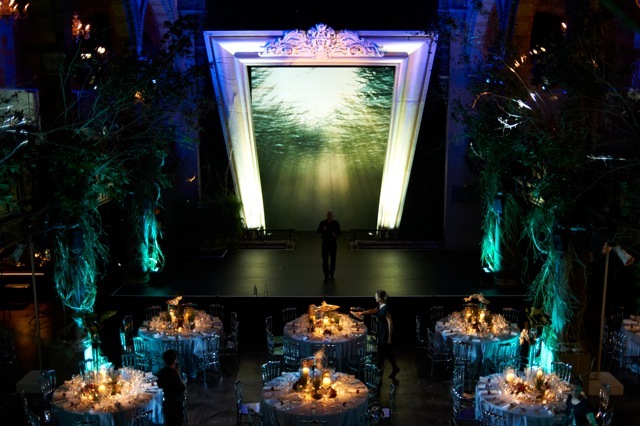 First impressions are always critical so we decided from the outset that the guest experience had to start from the first moment of the evening with the initial arrival at the building, which had to combine an echo of the Royal Opera House with a cool, watery ambience. Our craftsmen faced the entire floor of the Narthax of One Mayfair with mirror and draped out the walls with long hangings of Prussian blue velvet and thick silver swagging topped with glittering, crystal chandeliers and ornate antique rococo mirrors. A watery trompe l’oeil effect completed the picture. On entry into the Grand Hall, it appeared as though the guests were immersed under a riverbank with the balcony providing a water line below which we had created our dinner and performance space. Tangled, twisted roots cascading down the pillars, eau de nil table cloths, mirrored chairs and a watery projection placed within a giant silver frame completed the fairy tale picture in which to stage our myth inspired performance. In addition, tables were decorated with echeveria in willowy, fantastical vases, spherical glass globes were filled with reeds and pebbles while hand crafted fish sculptures created with a combination of recycled drift wood, tin and feathers appeared to float in space above the tables. By the time the Royal Ballet took to the stage to perform extracts from the ‘Dying Swan’ – Matthew Bourne’s acclaimed all male production of Swan Lake – and a newly choreographed commission of ‘Leda and the Swan’, the audiences’ imagination had been floated to another world. Our second water inspired event takes us far away from the centre of Mayfair and over to the Olympic Park , to Zaha Hadid’s inspired London Aquatic Centre, where we have been tasked with transforming the interior into a space in which to host a party for 700 guests. Bearing in mind the epic scale of the swimming and diving pools and the wave like undulation of the design, there was never any question that water was going to contribute strongly to the design of the whole evening. Our creative team was hugely inspired by the work of the photographer Mark Mawson who suspends brightly coloured powder paint in water and then creates stunning images of huge swirling cloud like shapes captured in a moment of time. A film showing these moving multi-colored shapes will form the centre piece back projection against which an international cast of artists, Olympic and international swimmers, divers and cirque style aerialists will entertain the guests to a specially created musical soundtrack evoking all the past twenty five years. A canvas on the scale of the London Aquatic Centre demands large impact performance elements and we were delighted to discover as part of the Music of the Spheres Festival on Clapham Common’s Boating Pond an astonishing floating giant sphere measuring fifteen meters, within which an aerialist is suspended. This incredible moon like apparition has floated across the waters of Finland, Portugal, the Thames and festivals including Latitude and, programmed for this event within a wide range of other visually arresting and incredible performances, will provide a stunning water based finale to this client’s 25th anniversary event next year. Water will continue to inspire us and how could it not since it is often said that H20 is ‘two parts water and one part obsession’?